The only course you need for the most important exam of your career! Expert instruction, patented technology, and unparalleled support make it easier to learn and easier to succeed. We believe that great things happen when people work together. Connect with your peers instantly in our Online Community and discuss CPA exam topics, difficult questions, and strategies to pass. With just a click, you can join the conversation from anywhere in the course and get the answers you need, when you need them. These all-inclusive, up to current standards, textbooks are perfect for when you want to get away from the computer. All four books include the same information as the electronic version and are great for those who prefer a physical book. 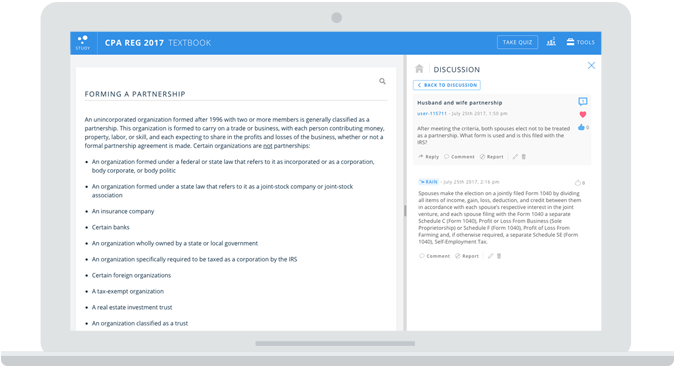 The intelligent textbook is your online CPA Study Guide loaded with advanced features. Easily bookmark sections for review, highlight important information, take notes, and create digital flashcards right from the pages of your textbook. It even uses your performance to guide your final review before the real exam, so you don't waste time studying the things you already know. Our study bank is one of the largest available, but that’s where the comparison ends. Don’t settle for the “old-school” tools of the past. Our adaptive study system learns about you, and helps you focus your CPA review on the right subjects. You can zero in on these areas using state-of-the-art filters that you won’t find anywhere else. Sit down for your CPA exam fully prepared. Our practice exams prepare you for the experience you can expect when you take the real test. Pass our CPA practice exams and schedule the real exam with confidence! Don’t ever feel overwhelmed again. If you have a question, cannot find the answer, or simply would like to see what others have to say – we’re here for you. With the click of a button you are in direct contact with an instructor who is dedicated to helping you pass this exam. Access 80 hours of engaging video lectures covering the key concepts you need to know to pass the CPA Exam. Dive deep into the specific areas that give you trouble with 470 concise lessons that bring complex topics to life with real-world examples. *Previous purchases are ineligible for offer. Offer is subject to change at any time. Eligibility for financing and rates is based on applicant’s creditworthiness. Applicants will be evaluated for loans with 3, 6 or 12 monthly installments at rates from 10-30% APR based on creditworthiness. Down payment may be required. Estimated payment amount excludes taxes and shipping fees. Affirm loans made by Cross River Bank, member FDIC. If you purchase educational materials directly from us, or on the fastforwardacademy.com website, your purchase is covered by our 30-day return policy. If for any reason you are unsatisfied with your purchase, you may request a refund of any item(s) purchased within the eligible return period. We may deny any return or exchange if it fails to meet our return policy criteria. Refunds for Continuing Education/Annual Filing Season Program purchases will be prorated based on the number of credit hours completed. If you purchase an exam preparation course from us, you can feel confident in knowing that you don’t need to pay for the same course again if it takes you longer than expected to pass the exam. We update our educational materials each year to adjust for changing rules and test specifications. In most years, a relatively small percentage of content changes from one testing season to the next (5%), and some exam parts might not change at all. We provide updates at no cost to the electronic textbook, and all questions in the Study Bank, and Practice Exams. You receive updates electronically, so you will not receive new physical books. When the new test season begins, all changes appear automatically in your online study tools. You have access to these updates so long as you continue to pursue your credential and so long as we continue to offer the course. Personal assistance from a coach who will create a study plan and guide you on areas of weakness. In order to qualify, you must forward your exam diagnostic results within 30 days of the exam date and the materials must have been purchased through FastForwardAcademy.com. Contact us for questions or to start a claim.